Baidu's recent poor performance has more to do with short-term thinking than long-term prospects. Let me tell you about a stock that serves as a prime example of what I call "short-term stupidity," but has lots of things going for it. Without even considering the stock's price, take a look at how revenue and earnings per share have grown since 2006. Source: BIDU Revenue TTM data by YCharts. Just to be clear about those numbers: Since 2006, revenue has ramped up 8,290%, while earnings per share have jumped an astounding 25,720%. That's an annual growth rate of 108% and 150% per year, respectively. 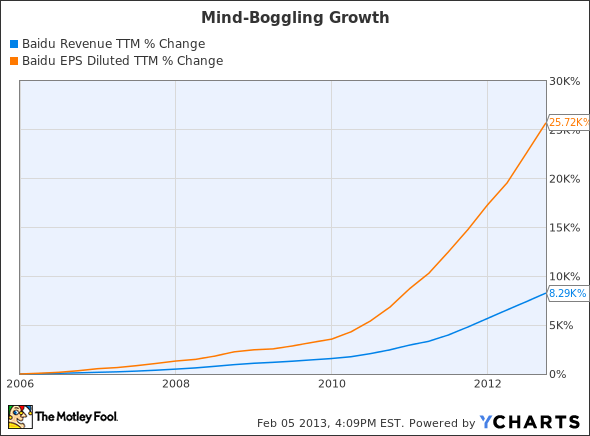 Clearly, though this type of growth can't continue forever, the stock must be trading for sky-high valuations, right? Wrong. Instead, this stock now trades hands at just 20 times earnings and 20 times free cash flow. Yesterday, the company shed 10% of its value. At the same time, analysts expect the company to grow earnings by 23% per year for the next three years, a number which is probably being low-balled, as it has beat analyst expectations in 15 consecutive quarters. For those of you who didn't read the chart above too carefully (darn YCharts for being so thorough! ), the company I'm talking about is China's largest search engine, Baidu (NASDAQ:BIDU). Though the numbers above might be compelling enough to convince you that there's a market mis-pricing taking place here, read below and I'll offer up two more reasons that short-term investors are missing the bigger picture and creating a great buying opportunity for their long-term brethren. Many people have compared Baidu to Google (NASDAQ:GOOGL), as each company dominates its home market's share of search queries. But dig a little deeper and you might see that Baidu has the potential to grow even more. The big difference is that the technological revolution that has taken place in the U.S. over the past 20 years is just getting started in China. Just take a look at where Internet penetration stands in both countries. The difference, however, is that China is a much bigger country. And, believe it or not, Baidu has an 80% market share of search in China, while Google sits at a still-impressive 67%. Think about it: an 80% Internet penetration in the U.S. with a 67% market share gives Google roughly 168 million regular users. If China had 80% Internet penetration and Baidu held its search market share around 75%, the company would have roughly 860 million regular users -- or an audience of more than five times that of Google. The problem, from the market's perspective, is that those kinds of adoption rates won't happen overnight. But long-term investors know that given a decade or so -- that's what it really means to be a long-term investor -- there's a pretty good chance Internet penetration will increase and that Baidu is focused on keeping its No. 1 spot. The other knock on Baidu lately is that expenses have been exceeding revenue increases. While this would normally be troublesome, I think we should be cutting the company some slack. As we saw when Larry Page took over at Google, these companies need to invest heavily in the future right now to put distance between themselves and the competition. That's especially true for Baidu, which has been facing pressure lately from Qihoo 360 (UNKNOWN:QIHU.DL). Now is exactly when Baidu should be spending money to create a moat, while it has over $5 billion in cash compared to Qihoo's $350 million. And I find it interesting that while analysts voice concerns about a switch to mobile, the company spent 70% more on research and development last quarter to help address the issue. That, plus the fact that Google has already shown mobile searches can compliment those on desktops, should give investors reason to breathe easy. Of course, I don't have a crystal ball. I can't predict if Baidu will execute mobile perfectly, and I don't know that it will be impervious from a continued attack by Qihoo. And God knows that if Baidu ends up having played financial shenanigans like some other Chinese companies, all bets are off. That being said, I feel rather certain that the company's recent poor stock performance has more to do with short-term investors wanting appreciation now rather than dire long-term concerns.